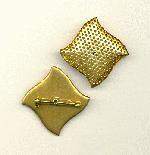 Perforated screen findings are typically used to wire beads for brooch and earring designs. Jan's Jewelry Supplies carries a large variety of screen brooch findings, screen earring findings and screen findings. This includes many vintage screen findings.